A man looks at a banner showing a map of the Korean Peninsula to wish for a successful inter-Korean summit in Seoul, South Korea, April 26, 2018. North Korean leader Kim Jong Un and South Korean President Moon-Jae-in will plant a commemorative tree and inspect an honor guard together after Kim walks across the border Friday for their historic summit, Seoul officials said Thursday. Final preparations are underway for Friday’s historic third summit between the leaders of North and South Korea. In the morning, North Korea Leader Kim Jong Un will cross the military demarcation line that divides the two Koreas at the village of Panmunjom, the historic site where the Korean War armistice was signed in 1953. He will be met by South Korean President Moon Jae-in on the South Korean side of the heavily fortified demilitarized zone. This will be the third inter-Korean summit, but it will be the first time that a leader from the communist North will enter the democratic South. The summits in 2000 and 2007 were held in North Korea. A woman puts a sign bearing messages wishing for peace in the two Koreas on a map of the Korean Peninsula in Seoul, South Korea, April 26, 2018. Kim will travel with an official delegation that includes his sister, Kim Yo Jong, who led the North’s delegation to the Winter Olympics in South Korea, Kim Yong Nam, the North’s nominal head of state, and Kim Yong Chol. Kim Yong Chol was previously the head of the North’s military intelligence agency and has been named by South Korea as being responsible for ordering the deadly 2010 sinking of the Cheonan, a South Korean navy vessel. It is unclear if Kim Jong Un’s wife, Ri Sol-ju, will be part of the official delegation from the North. She recently traveled with Kim when he visited Chinese President Xi Jinping in Beijing. South Korea will hold a welcoming ceremony for the North Korean leader that will include a military honor guard review. During past summits, North Korea also organized the same level of ceremonial guard used to underscore friendly relations with an important visiting head of state. The two leaders will pose together for pictures, and plant a pine tree in the DMZ to symbolize Korean reconciliation. The leaders from the North and South may also walk together along a historic footbridge called the “Bridge of No Return” that was used for prisoner exchanges at the end of the Korean War. Moon and Kim will hold direct talks in the Peace House conference hall, both in the morning and the afternoon, but the North Korean delegation will return to their side of the border for lunch. 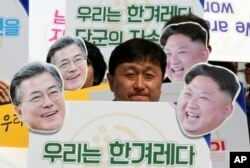 An activist with cutouts of South Korean President Moon Jae-in, left, and North Korean leader Kim Jong Un participates in a rally welcoming the planned summit between South and North Korea in Seoul, South Korea, April 25, 2018. The signs read: "We Are A Nation." This first inter-Korean summit in over a decade marks a dramatic turn toward diplomacy to resolve the growing North Korean nuclear threat, after a two-year period of continuous North Korean nuclear and missile tests. The U.S., however, argues that further testing is needed to demonstrate operational ICM capability. Also in the last year, U.S. President Donald Trump’s maximum pressure campaign led international efforts to impose tough sanctions restricting most North Korea exports, that may have forced Kim to pursue talks to seek sanctions relief. Recently North Korea announced it would close its Punggye-ri nuclear test site, but analysts are skeptical that these measures would lead to any permanent reduction in the country’s nuclear capabilities. This year North Korea participated in the recent Olympics in South Korea, and Kim subsequently expressed a willingness to engage in denuclearization talks. 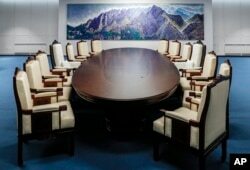 This is a meeting room for the April 27 summit between South and North Korea at the Peace House at the southern side of the Panmunjom in the Demilitarized Zone, South Korea. The photo was provided by South Korea Presidential Blue House, April 25, 2018. The inter-Korean summit is expected to produce a joint statement committing to the denuclearization of the Korea Peninsula, and also a clear definition of what a denuclearization outcome would entail. “It is very difficult to know at what level they will agree on. This is more so because it is not something that can be fully completed at the summit between two Koreas,” said the Inter-Korean Summit Preparation Committee chairman. While North Korea will only make a nuclear deal with the United States, President Moon wants to use the inter-Korean summit to create a framework for talks between Kim and Trump, who are expected to meet in May or June. “For President Moon Jae-in, he would like to see a substantial improvement in relations between the U.S. and North Korea by serving as a mediator,” said Kim Yong-hyun, a professor of at Dongguk University in Seoul. The U.S. has demanded the complete dismantlement of the North’s nuclear arsenal before reducing sanctions. Pyongyang wants a more step-by-step approach that would likely provide some sanctions relief for freezing its current nuclear capabilities. The leaders from North and South Korea are also expected to endorse pursuing a peace treaty to replace the 1953 armistice to end the Korean War, but such a measure will require the participation of the U.S. and China as signatories to the truce. Within the DMZ, security was tight Thursday, the day before the summit. About 2,800 journalists have registered at the main press center to cover the summit.